This is a wild image, Sam. While wonderfully artistic, it seems as though it may actually be a disaster ecologically. As you know, algal build-up here is typically from phosphate fertilizer runoff from lawns. 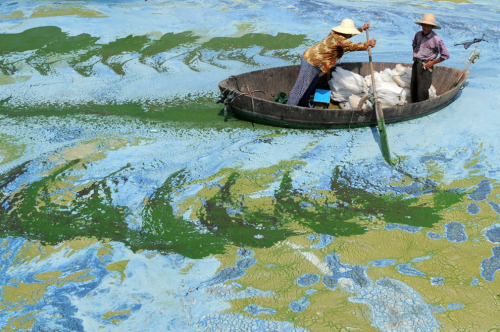 As the algae multiplies in response to the phosphates, the oxygen is depleted in the water resulting in fish kill. I wonder what is really happening here! Thanks for sharing!